Whether you just carry the weapon or you are the weapon, the bad guys won't stand a chance with this unlikely duo. The WE M-92 full metal gas blow back pistol is based off the capable M9 pistol adopted by the US Army and other military branches to fulfill the needs of a reliable side-arm. A tough solid build from frame to slide, it features a functional slide release, ambidextrous safety, take down lever, and magazine release with a 26-round double-stack magazine. Old and always reliable is the classic and vetted HFC gas blow back revolver with a 4" barrel and a swing out cylinder. Place your shots carefully because it only carries 6 full metal airsoft shells. As a double-action trigger you'll simply need to pull the trigger until you hear a click. 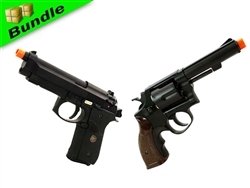 As gas blow-back pistols they are a blast to use and powered by a pressurized gas avaiable as green gas (a propane and silicon oil blend).